California Gov. 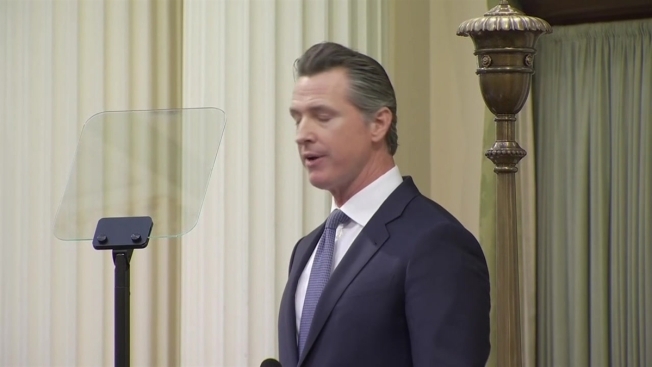 Gavin Newsom delivered his first State of the State address Tuesday, a day after declaring he wouldn't participate in the Trump administration's "political theater" over border security. Let’s start with the fear mongering from the White House about the so-called "emergency" at our border. For me, this is an echo from fifteen years ago. Another third will boost the National Guard’s statewide counter-drug task force by redeploying up north to go after illegal cannabis farms, many of which are run by cartels, are devastating our pristine forests, and are increasingly becoming fire hazards themselves. Abandoning high speed rail entirely means we will have wasted billions of dollars with nothing but broken promises and lawsuits to show for it. Conveyance and efficiency. And recycling projects like we're seeing in Southern California’s Met Water District, expanding floodplains in the Central Valley, groundwater recharge, like farmers are doing in Fresno County. We need a portfolio approach to building water infrastructure and meeting long-term demand. The teachers’ strike in LA is over – but the need to confront its underlying causes has only just begun. Understaffed schools, overcrowded classrooms, pension pressures, the achievement gap, and charter school growth -- these stressors are showing up all over the state, right here in Sacramento, in Fresno, and Oakland. Seven years ago, we invested $47.3 billion in our schools. Next year, with your support, we’ll invest more than $80 billion -- that includes $576 million for special education. But it's not enough. We're still 41st in the nation in per pupil funding. Something needs to change. We need to have an honest conversation about how we fund our schools at a state and local level. We need a new President for the State Board of Education, to lead the way and work alongside State Superintendent Tony Thurmond, and to lift up all of our students. And my pick for that position is nationally recognized education expert Linda Darling Hammond. So many of California’s homeless – whether they're families, veterans, victims of rent spikes, or survivors fleeing domestic violence – are invisible and left behind by our society. Too many on the streets are suffering from bipolar disorder, schizophrenia or paranoia. Many are self-medicating with drug or alcohol as a consequence. Our homelessness crisis has increasingly become a public health crisis. Last year, there was a Hepatitis-A outbreak in San Diego. Recently, there was an outbreak of Syphilis in Sonoma. And now, typhus in Los Angeles. Typhus. That's a Medieval disease. In California. In 2019. Tying together many of the hard challenges we face is the broader cost crisis. In a recent survey, 61% of young adults in California said they can’t afford to live here. California should never be a place where only the well-off can lead a good life. But there is no way we can achieve our ambitious targets unless we train a skilled workforce big enough to meet this challenge… and those workers deserve wages high enough to support their families. I applaud this legislature for passing the first-in-the-nation digital privacy law last year. But California's consumers should also be able to share in the wealth that is created from their data. And so I’ve asked my team to develop a proposal for a new Data Dividend for Californians, because we recognize that your data has value and it belongs to you. Remember the story of the registered nurse in Paradise who was sitting in traffic, trying to escape the fire, as flames started to engulf his car. He thought, "this is it." He recorded a goodbye video for his family. Then a miracle occurred: a bulldozer cleared burning cars out of his path. At that point, he could have driven away as fast as possible. That’s what a lot of people would have done.